The Government Accountability Office (GAO) is a government agency that provides auditing, evaluation, and investigative services for the United States Congress. It is the supreme audit institution of the federal government of the United States. The GAO was established as the General Accounting Office by the Budget and Accounting Act of 1921. The act required the head of the GAO to "investigate, at the seat of government or elsewhere, all matters relating to the receipt, disbursement, and application of public funds, and shall make to the President ... and to Congress ... reports [and] recommendations looking to greater economy or efficiency in public expenditures". According to the GAO's current mission statement, the agency exists to support the Congress in meeting its constitutional responsibilities and to help improve the performance and ensure the accountability of the federal government for the benefit of the American people. 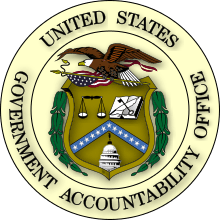 The name was changed in 2004 to Government Accountability Office by the GAO Human Capital Reform Act to better reflect the mission of the office. While most other countries have government entities similar to the GAO, their focus is primarily on conducting financial audits. The GAO's auditors conduct not only financial audits, but also engage in a wide assortment of performance audits. Over the years, the GAO has been referred to as "The Congressional Watchdog" and "The Taxpayers' Best Friend" for its frequent audits and investigative reports that have uncovered waste and inefficiency in government. News media often draw attention to the GAO's work by publishing stories on the findings, conclusions and recommendations of the its reports. Members of Congress also frequently cite the GAO's work in statements to the press, congressional hearings, and floor debates on proposed legislation. In 2007 the Partnership for Public Service ranked the GAO second on its list of the best places to work in the federal government and Washingtonian magazine included the GAO on its 2007 list of great places to work in Washington, a list that encompasses the public, private, and non-profit sectors. The GAO is headed by the comptroller general of the U.S., a professional and non-partisan position in the U.S. government. The comptroller general is appointed by the president, by and with the advice and consent of the Senate, for a 15-year, non-renewable term. The president selects a nominee from a list of at least three individuals recommended by an eight-member bipartisan, bicameral commission of congressional leaders. During such term, the comptroller general has standing to pursue litigation to compel access to federal agency information. The comptroller general may not be removed by the president, but only by Congress through impeachment or joint resolution for specific reasons. Since 1921, there have been only seven comptroller generals, and no formal attempt has ever been made to remove a comptroller general. Labor-management relations became fractious during the 9-year tenure of the 7th comptroller general, David M. Walker. On September 19, 2007, GAO analysts voted by a margin of two to one (897–445), in a 75% turnout, to establish the first union in the GAO's 86-year history. The analysts voted to affiliate with the International Federation of Professional and Technical Engineers (IFPTE), a member union of the AFL-CIO. There are more than 1,800 analysts in the GAO analysts bargaining unit; the local voted to name itself IFPTE Local 1921, in honor of the date of the GAO's establishment. On February 14, 2008, the GAO analysts' union approved its first-ever negotiated pay contract with management; of just over 1,200 votes, 98 percent were in favor of the contract. In 2012, the GAO won the Ig Nobel Prize for literature for issuing an interim report titled "Defense Management: Actions Needed to Evaluate the Impact of Efforts to Estimate Costs of Reports and Studies", a follow-up on a previous reports about the cost of reports and studies. Due to its nature of a specific meta-study, the Ig Nobel Prize motivation described it as a "report about the report about reports about reports". Most GAO studies and reports are initiated by requests from members of Congress, including requests mandated in statute, and so reflect concerns of current political import, but many reports are issued periodically and take a long view of U.S. agencies' operations. GAO also produces annual reports on key issues such as Duplication and Cost savings and High Risk Update. Since 2007, Congress has established a permanent TA function within GAO. This new operational role augments GAO’s performance audits related to S&T issues, including effectiveness and efficiency of U.S. federal programs. In 2010, GAO joined European Parliamentary Technology Assessment (EPTA) as an associate member. In the last three years, GAO has completed TA reports on three topics, the most recent one being released in 2011 – rail security, climate engineering, and alternate neutron detectors. In the climate engineering report, Congress requested GAO to examine three areas: the current S&T state of climate engineering, views of experts on the future of climate engineering research, and potential public responses to climate engineering. When the GAO receives a request to conduct TA, it follows five phases: Acceptance, Planning, Data Gathering and Analysis, Product development and Distribution and Results. Phases one and two include selecting the topic and initiating the TA plan while the other ones are respectively: conducting TA, followed by developing the report and ensuring its accuracy and integrity, and finally receiving feedback from Congress and developing lessons learned to enhance the TA process. The GAO describes the TA as providing "thorough and balanced analysis of critical technological innovations that affect our society, the environment, and the economy" explaining "the consequences that each featured technology will have on federal agencies and departments, and their wider impacts on American society". This broad working definition enables GAO analysts to utilize TA as a tool for policy analysis. Technology assessments at GAO are conducted in accordance with GAO’s quality assurance framework. GAO initiates technology assessments through congressional mandates, requests from congressional leaders, and through the authority of U.S. Comptroller General. The Technology Assessment section of GAO's website  offers latest TA reports and videos. ↑ "GAO at a Glance". Government Accountability Office. Retrieved January 27, 2011. ↑ Walker, David M. (July 19, 2004). "GAO Answers the Question: What's in a Name?" (PDF). Roll Call. ↑ < "An interim report about the report about reports about reports". Retrieved July 30, 2014. ; "Actions Needed to Evaluate the Impact of Efforts to Estimate Costs of Reports and Studies GAO-12-480R, May 10, 2012". Gao.gov. Retrieved August 4, 2013. 1 2 "Press Release". US Government Accountability Office. Retrieved January 8, 2011. ↑ "Most Recent Federal Fiscal Outlook Report". Government Accountability Office. Retrieved January 27, 2011. 1 2 "Measuring the Deficit: Cash vs. Accrual". Government Accountability Office. Retrieved January 19, 2011. ↑ "2010 Financial Report of the United States Government (vid. pp.v, 43)" (PDF). Government Accountability Office. Retrieved January 7, 2011. ↑ "Strategic Plan: Serving the Congress and the Nation, 2010 –2015" (PDF). Government Accountability Office. Retrieved January 27, 2011. ↑ U.S. GAO - Technology Assessment. Gao.gov. Retrieved on July 19, 2013. ↑ Auditoria Superior de la Federación. ASF. Retrieved on July 19, 2013.